Get more out of every day. We appreciate your interest in our inventory, and we’re sorry we don’t have exactly what you’re searching for at this time. Please complete the form below to let us know what you’re looking for, or please call us at 401-352-6861. The dynamic design of Avalon Hybrid is one of a kind and will always be that way: a flowing shape with aggressive details and efficiency at its core. It’s a new level of refinement, and it’s ready to face tomorrow head-on. Avalon Hybrid’s unmistakable front grille is more than just its aggressive looks. Its integrated grille shutter automatically opens and closes to optimize the amount of air flowing in, for better aerodynamics and engine operation efficiency. Beneath the rear bumper, a dual exhaust with quad chrome tips, along with a rear diffuser, gives Avalon Touring a powerful look. Intricately designed LED front headlights and rear taillights on Hybrid Limited feature dynamic auxiliary turn signals that shine a light on Avalon’s precision and premium feel. Complementing Avalon Hybrid’s exterior, the available 18-in. SuperChrome aluminum alloy wheels add to its sophisticated look. Enter and be surrounded by purposeful design. The glow of Hybrid Limited’s ambient lighting in the center console and door panels not only feels like a warm welcome, but it also helps guide your movements during the night. Authentic materials and available Cognac Leather trim welcome you inside the refined interior. Even road noise has been suppressed, for a quieter cabin during every drive. Hybrid Limited features genuine wood across the dash and door panels to highlight the quality that goes into this flagship vehicle. Hybrid Limited has a unique perforation pattern on its seats, and high-end quilted two-tone stitching flowing from the door panels to the seats. Avalon Hybrid’s available heated and ventilated front seats rapidly aerate or slowly warm to your desired comfort level. Available rear heated seats will also let rear passengers warm up when it’s cool outside. Avalon features tangential vents on the sides of its front bumper, an available rear spoiler, an available rear diffuser and even underbody panels to help shave its coefficient of drag to 0.27, increase fuel efficiency and improve vehicle quietness. Noise- and vibration-reducing technologies, materials and manufacturing processes help isolate road and wind noise, for a cabin that’s quieter and more refined. Avalon’s available Engine Sound Enhancement (ESE) intensifies the engine’s sound through the vehicle’s audio system. The intake sound generator and sport exhaust will also produce an aggressive note during ignition, idle and acceleration. 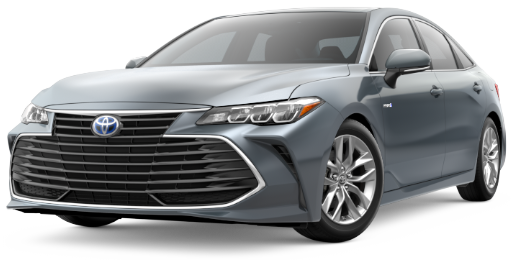 From its compact battery and lightweight power control unit to its manual-like Sequential Shiftmatic™ shifting and up to an estimated 44 combined mpg,1 Avalon Hybrid’s newly developed 2.5-liter Dynamic Force Engine delivers amplified fun. 12019 EPA-estimated mileage. Actual mileage will vary. Found within the floating center stack is Avalon’s next-generation Entune™ 3.03 system. A large 9-in. Multimedia touch-screen display comes with pinch-and-zoom navigation controls that are intuitive and easy to use. Get important information and fun for the road with Entune™ 3.02 App Suite, and connect up to five devices using its onboard Wi-Fi Connect Powered by Verizon2 hotspot. 2Be sure to obey traffic regulations and maintain awareness of road and traffic conditions at all times. Apps/services vary by phone/carrier; functionality depends on many factors. Select apps use large amounts of data; you are responsible for charges. Apps and services subject to change. See toyota.com/entune for details. 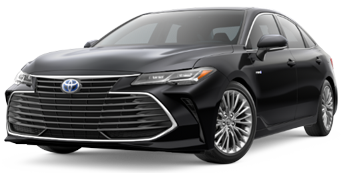 A Toyota first, Avalon offers Apple CarPlay™4 support as a standard feature. Pair your compatible iPhone®5 and get directions, make calls, send and receive messages, and listen to your own playlist - all while maintaining focus on your drive. 4Apple CarPlay® is a registered trademark of Apple Inc. Apps and services subject to change at any time without notice. 5iPod®, iPhone®, and App Store are registered trademarks of Apple, Inc. All rights reserved. Experience the sound of luxury through Avalon’s available JBL6 w/Clari-Fi™7 audio system. With 1200 watts, 14 speakers, 7.1-channel surround sound, high-quality hardware, software and structural engineering, phenomenal sound is delivered to amp up every drive. 6 & 7JBL® and Clari-Fi™ are registered trademarks of Harman International Industries, Incorporated. Get all the vital info you need at a glance. Avalon’s 7-in. Multi-Information Display within the instrument cluster is easy to use and can be customized to show you how much fuel you have left, check your current mpg, get turn-by-turn directions, and more—all on one display. No wires. No worry. Avalon features available Qi-compatible wireless smartphone charging.8 Simply place your Qi-compatible device underneath the center stack’s non-slip surface to easily charge it up. And if you do need to hook up, easily connect to one of five USB 2.0 ports9 that let anyone find a connection from any seat. 8Qi wireless charging may not be compatible with all mobile phones, MP3/WMA players and like models. When using the wireless charging system, avoid placing metal objects between the wireless charger and the mobile device when charging is active. Doing so may cause metal objects to become hot and could cause burns. Power tilt/slide moonroof with sliding sunshade and Qi wireless smartphone charging available early fall 2018 on XLE and Hybrid XLE models. 9May not be compatible with all mobile phones, MP3/WMA players and like models. Full LED headlights provide a brighter light out in front. Available adaptive cornering lights not only light up every turn, but also illuminate when in Reverse. Avalon’s available Bird’s Eye View Camera10 with Perimeter Scan uses front-, side-, and rear-mounted cameras to display a composite view as seen from above. 10The Bird's-Eye-View Camera does not provide a comprehensive view of the area surrounding the vehicle. You should also look around outside your vehicle and use your mirrors to confirm surrounding clearance. Environmental conditions may limit effectiveness and view may become obscured. See Owner’s Manual for additional limitations and details. Avalon’s available Intelligent Clearance Sonar (ICS)11 warns you both audibly and visually when it detects nearby pedestrians or vehicles. Rear Cross-Traffic Braking (RCTB)12 is designed to reduce engine power and apply the brakes if necessary. 11Intelligent Clearance Sonar (ICS) is designed to assist drivers in avoiding potential collisions at speeds of 9 mph or less. Certain vehicle and environmental factors, including an object's shape and composition, may affect the ability of the ICS to detect it. Always look around outside the vehicle and use mirrors to confirm clearance. See Owner’s Manual for additional limitations and details. 12Do not rely exclusively on the Rear Cross-Traffic Braking system. Always look over your shoulder and use your mirrors to confirm rear clearance. There are limitations to braking capability and the function, detection and range of the sensors. See Owner’s Manual for additional limitations and details. The Blind Spot Monitor (BSM)13 is designed to warn you when a vehicle in the next lane enters Avalon’s blind spot on either side. When in Reverse, Rear Cross-Traffic Alert (RCTA)14 helps detect vehicles approaching from either side, warning you with side mirror indicators and a warning tone. When equipped with the available Bird’s Eye View Camera,15 visual alerts are also shown on multimedia display. 13Do not rely exclusively on the Blind Spot Monitor. Always look over your shoulder and use your turn signal. There are limitations to the function, detection and range of the monitor. See Owner’s Manual for additional limitations and details. 14Do not rely exclusively on the Rear Cross-Traffic Alert system. Always look over your shoulder and use your mirrors to confirm rear clearance. There are limitations to the function, detection and range of the system. See Owner’s Manual for additional limitations and details. 15The Bird's-Eye-View Camera does not provide a comprehensive view of the area surrounding the vehicle. You should also look around outside your vehicle and use your mirrors to confirm surrounding clearance. Environmental conditions may limit effectiveness and view may become obscured. See Owner’s Manual for additional limitations and details. *MSRP excludes the Delivery, Processing, and Handling Fee of $920 for Cars (Yaris, Yaris iA, 86, Corolla, Corolla HB, Camry, Camry HV, Prius LB, Prius c, Prius Prime, Mirai, Avalon, Avalon HV), $1045 for Small/Medium Trucks, SUVs and Van (C-HR, RAV4, RAV4 HV, Highlander, Highlander HV, 4Runner, Sienna, Tacoma), $1,295 for Large SUVs (Sequoia, Land Cruiser), and $1,395 for Large Truck (Tundra). (Historically, vehicle manufacturers and distributors have charged a separate fee for processing, handling and delivering vehicles to dealerships. Toyota's charge for these services is called the "Delivery, Processing and Handling Fee" and is based on the value of the processing, handling and delivery services Toyota provides as well as Toyota's overall pricing structure. Toyota may make a profit on the Delivery, Processing and Handling Fee.) Excludes taxes, license, title and available or regionally required equipment. The Delivery, Processing and Handling Fee in AL, AR, FL, GA, LA, MS, NC, OK, SC and TX will be higher. The published prices do not apply to Puerto Rico and the U.S. Virgin Islands. Actual dealer price will vary. 2The Smart Key System may interfere with some pacemakers or cardiac defibrillators. If you have one of these medical devices, please talk to your doctor to see if you should deactivate this system. 3Be sure to obey traffic regulations and maintain awareness of road and traffic conditions at all times. Apps/services vary by phone/carrier; functionality depends on many factors. Select apps use large amounts of data; you are responsible for charges. Apps and services subject to change. See Owner’s Manual for additional limitations and details. 4The backup camera does not provide a comprehensive view of the rear area of the vehicle. You should also look around outside your vehicle and use your mirrors to confirm rearward clearance. Environmental conditions may limit effectiveness and view may become obscured. See Owner’s Manual for additional limitations and details.